I am offering a brand new SIG P226 X-6 Supermatch 9mm SAO package. The package includes brand new Handgun, factory cardboard box with serial number,(2) 19rd magazines, test target, manual, tools, lubricant and case. 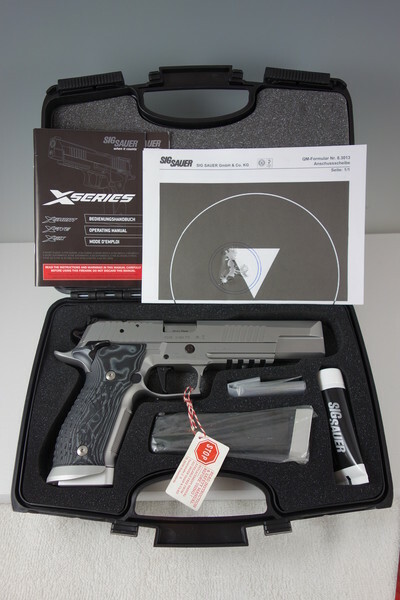 The X-Six Supermatch was designed by the elite gunsmiths of the Sig Mastershop and features adjustable target sights, stainless steel frame and slide, extended magazine release, Hogue G-10 grips, adjustable single action skeletonized hammer, extended mag well, test target, box, manual and two 19rd magazines. This is a brand new hard to extremely rare X-Six Supermatch complete package. Please carefully review the photos for details.Note that this pistol was imported through an independent US Importer. The Importer markings are directly in front of the rail on the bottom of barrel housing. The text is too small (1/16") to photograph. NOTE: Please be aware of the legal status of this firearm and 19 round magazine capacity before purchasing. I do not ship to: CA and all other firearm unfriendly cities, counties and states. I do not ship outside of the Continental US including US territories. I will not accept returns under any circumstances. Please know your Local and State laws before purchasing. PRICE: $5,900.00 shipped to your FFL. PAYMENT: USPS Money Order or the following Credit Cards: American Express, Discover, MasterCard or Visa. NOTE: There is a 3% CC surcharge if you choose to use a credit card. SHIPPING: Included. USPS Priority Mail with tracking to your FFL. Shipping insurance is not included.